I had lunch with Jules Starck today. She’s the smartest researcher I know, but she’s off to India for three weeks, so I thought I’d better pick her brain before she left, just in case she ate a bad curry and never returned. Jules is the Insight Manager at De Pasquale and she spends her days dispensing wisdom – the kind you want to hear. Today, I’m pleased to announce, was particularly fruitful. It turns out that Jules was doing some research into buyer behaviour in a recession and she’d written up the findings in a very easy to digest document, complete with catchy titles. 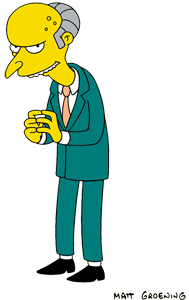 You’ll already be familiar with the Lipstick Effect and possibly the Aldi Effect, but The Mr Burns Effect will be new to you, as will the others on the list. I’d link to Jules’s blog, Twitter Profile or LinkedIn page, but she doesn’t have any of those. Further proof that you can be under 30, smart and socially aware without socially networking your arse off. The Real Money effect – consumers avoid using voluntary credit as they fear committing to a future debt i.e. Will I have the money to pay off that sofa in 24 months time?